Carolyn Thornton, aged 86, died peacefully on March 7, 2018 surrounded by her family after a brief battle with cancer. Carolyn was born April 30, 1931 in Wood County, Ohio, the daughter of Clyde and Elsie Facer. She grew up on a farm with four siblings. 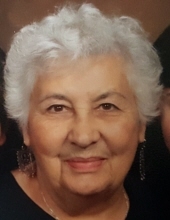 Carolyn graduated from Lake High School in 1949 and attended The Ohio State University graduating in 1952 with a Bachelor of Science Degree in Education. In 1953, Carolyn married the love of her life, Brice Thornton, who had completed his degree in Engineering Science the previous year at Cleveland State University. They moved to Long Beach, California where she started teaching elementary school while Mr. Thornton was working as an aerospace engineer in Southern California. In 1959, the first of their three children was born and Carolyn became a stay at home mom, raising the children in Santa Ana, California. When the youngest child was in Jr. High School, she returned to the work force as an insurance representative and financial planner, she continued working into her mid-seventies. Carolyn thoroughly enjoyed cooking and entertaining. She was a lifelong Lutheran and was very involved in church activities. As an active member in the Ohio State Alumni Association, she was an avid fan of the Buckeyes. She was a member of P.E.O. Chapter IE, CA and President 2001-03. Carolyn was preceded in death by her husband Brice, of 45 years, in 1998. She is survived by her daughters, Alicia Campbell and Elaine Brinkman, son and daughter-in- law, David and Lydia Thornton. Eight grandchildren and six great grandchildren. Graveside services will be Friday March 30, 2018 at 2:30 p.m. at Fair Haven Cemetery in Santa Anna, CA. To plant a tree in memory of Carolyn F. Thorton, please visit our Tribute Store. "Email Address" would like to share the life celebration of Carolyn F. Thorton. Click on the "link" to go to share a favorite memory or leave a condolence message for the family.